ISMU is now an examination center for the acquisition of the PLIDA certificate of competence in the Italian language. obtain a long stay permit (A2 level). Who can take Plida test? 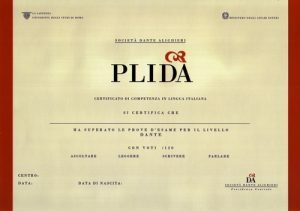 PLIDA certificate is addressed to those people who are not Italian native speakers. Moreover, all the Italian citizens or foreign citizens whose mother tongue is Italian who need a certificate of competence in Italian for study, work or other reasons can take the PLIDA test. Fondazione ISMU – Via Galvani 16, 20125 Milano. MM2 e MM3 – Stazione Centrale. How much does PLIDA test cost? To take only some parts of the exam (single skills) download le quote PLIDA. The registration fee cannot be refunded. Candidates who give up taking the test will receive a credit to take it in the next session only if they communicate their resignation to ISMU, by email, at least 20 days before the exam date. Candidates who can’t take the exam will receive a credit only if they submit a medical certificate or other document proving the impossibility of being present the day of the test within 30 days after the examination date. I decided to join the PLIDA test. What do I have to do? 3. Send the receipt of the bank transfer to plida@ismu.org indicating your name and surname in the e-mail. 4. Wait for the reply to your email, as confirmation of the enrollment. 5. Wait for the ISMU email communicating details about the exam. When is it possible to have PLIDA test results? Results within 70 working days after the exam date. How to prepare for PLIDA exams? The ISMU Foundation has a Documentation Center (Ce.Doc.) where you can find many books to learn Italian. At Ce.Doc. you can also study alone or in small groups. Monday, Wednesday and Thursday from 9.30 to 16.00 and Tuesday from 9.30 to 17.30. It is closed for the main holidays and in August.